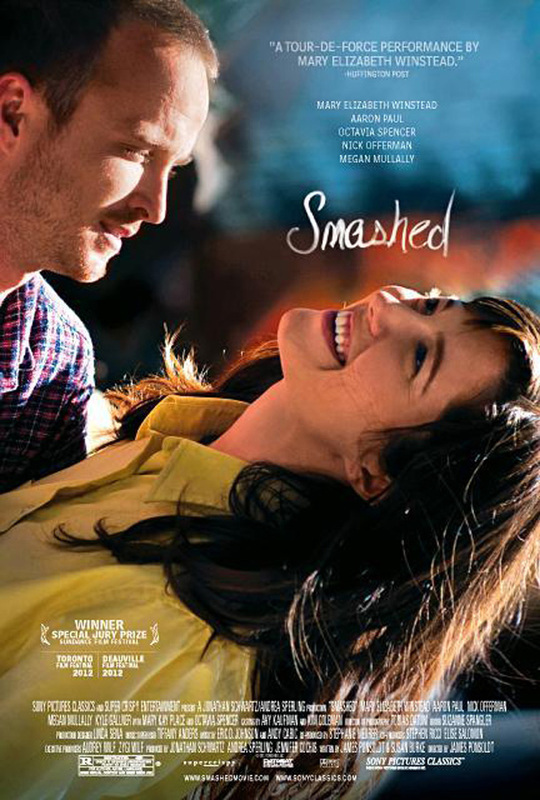 I didn’t know much about Smashed going in, only that it premiered at Sundance with a considerable amount of praise. I wasn’t sure if it was going to be more comedic or dramatic. Frankly, I wasn’t really expecting much. Then, I saw it and was totally blown away. Smashed is an emotional and thoughtful film about a couple fighting alcoholism. Mary Elizabeth Winstead stars as Kate Hannah, a young school teacher with a drinking problem. Kate and her husband, Charlie (Aaron Paul), love to go out to the bar, drink and get wasted. For a while, they think that they don’t have a problem. Until one day, Kate wakes up in the middle of nowhere, and she slowly begins to realize that her drinking is a problem. As Kate struggles to stop drinking and Charlie continues to keep his lifestyle, the two are constantly at odds with each other, not knowing if their relationship can survive the change. The acting in this film is impeccable. Both Winstead and Paul give wonderful performances. I liked Winstead before, but after this movie, she totally impressed me. I’ve seen actors play drunk hilariously bad, and Winstead gave a convincing and heartbreaking performance. As for Paul, he was incredible in that final scene, just as much heartrending as Winstead. Octavia Spencer also stars as Kate’s sponsor. Spencer does a fine and memorable job in this supporting role. Nick Offerman and Megan Mullally are also notable as Kate’s co-workers. The story was very much elevated by the acting. The emotion is so key for stories battling addiction. On the other hand, there were some light moments with really awkward humor (thanks, Offerman). The switch to humor was a little jarring, but it worked within the story and gave it a more authentic feel. Life, even when struggling, isn’t all doom and gloom. There are some cringing moments as you see Kate’s problems and lies uncomfortably escalate. Besides the performances, the story’s realistic tone is what makes Smashed so effective. With the exception of a few, I haven’t been impressed with many indies this year. So coming across Smashed was almost like a godsend. It’s one of my favorite films of the year. Breaking Bad fans are going to want to see Aaron Paul in this role. Don’t even let Winstead’s character’s wardrobe make you turn away. (I still don’t understand why they gave her such hideous clothes. It was borderline distracting, but Winstead’s so good that you let it go.) Anyway, the point is: Go see this movie. Smashed is now playing in select theaters.